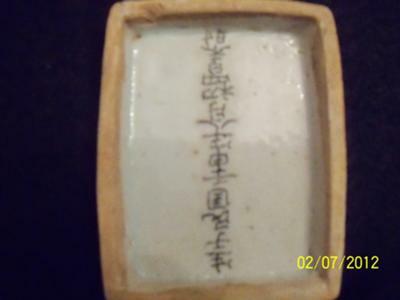 I purchased the blue and white porcelain box with the Chinese writing on the interior. I have attached pictures and welcome any information that you can offer, and if I should seek an appraisal. Thank you for your advice and valuable service. James, I believe this refers to the grandmother, not the great grandmother. The character "bi" indicates the deceased mother. Together with "zu" before it it would be the grandmother, I think. Anyway, the character is hardly used today, as are some of the others. Linda, I believe what you have is a partially or completely fake epitaph box. I'v heard that such fakes do exist from one of the few people who collect epitaphs. 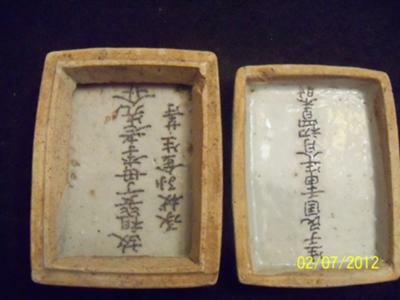 This type of epitaph is usually using a seal ink box that the deceased used during his/her lifetime. The characters are drilled into the box and is put into the tomb. You should upload pictures of the bottom/sides of the box itself. Depends on these whether all is fake or only the lid. 1. The size of lid and box isn't exactly the same. 2. The decoration of the lid is a (low quality) try at copying the decoration that these seal ink boxes usually have. Such boxes usually were made in the Jiaqing reign of the 19th century. Apart from the decoration work itself the blue tone is also not right. This is painted using chemical blue, available only later. 3. The white glaze inside the box is different from the lid. 4. 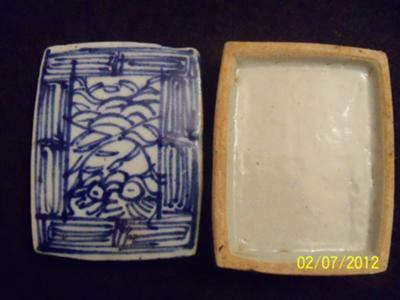 The character type of lid and box is different. The lower part of the box apparently is the epitaph of someone's deceased grandmother, name, etc. given. No death date is given as it usually would. That could be inside the original lid, though. There are some old characters that are not in common use today, meaning it might have been written originally by a person of the past. 6. The lid, on the other hand, gives the birth date of someone which amounts to 1932. I doubt that anyone born at that time still would get an epitaph like this upon his or her death. This is a thing of the more distant past. Up to now the latest such epitaph I know of is from the late 19th century. My conclusion is that either all is fake, or that the lid was added to a genuine box later, perhaps because its lid was missing. Anyway, the current lid looks highly suspicious to me. If you do a Google image search using the term in brackets "青花印尼盒", you should find pictures of various blue and white seal boxes. The rectangular type is the one yours should be. 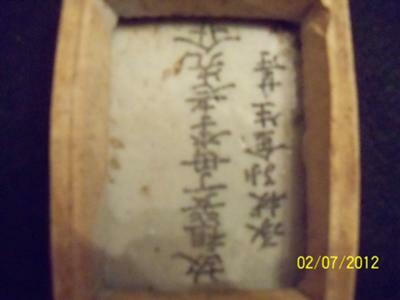 I think one inscription refers to a dead great grandmother? While the other says a birth date that is dated to the republic era (after 1911). Peter may know the exact year better than I.